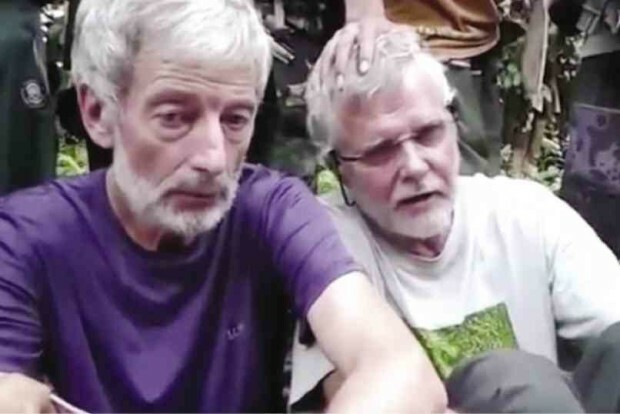 MANILA, Philippines - An official of the Armed Forces of the Philippines (AFP) believes that the severed head recovered in Jolo, Sulu on Monday, June 13 likely belongs to Robert Hall, a Canadian hostage of the terror group Abu Sayyaf. According to AFP Western Command spokesperson Major Filemon Tan Jr., the head was recovered in front of the gate of Jolo Cathedral at around 8:45 pm, just hours after the ransom deadline had lapsed. Tan said that the Caucasian-looking head bears a close resemblance to Hall. Tan clarified that the Scene of the Crime Operatives (SOCO) still need to carry out DNA test on the head before confirming that the head belongs to Hall. "Bagama't nakikita po natin na ang features niya ay kay Robert Hall, hindi po natin pwedeng i-declare iyan hanggang hindi dumaan sa proseso, sa DNA testing na lahat po ay gagawin ng PNP SOCO before they can formally confirm na iyan po talaga ang ulo ni Robert Hall," Tan explained. In September 2015, Hall along with three other people were captured by Abu Sayyaf Group (ASG) from a resort on Samal Islands. Initially, the militants demanded a ransom of P1 billion each for the captives but later reduced it to P300 million each early in 2016. However, both the Canadian and Philippine government have a policy against paying ransom in such cases. Authorities are currently looking for the foreigner’s body, according to Tan. In April this year, the ASG beheaded Canadian mining executive John Risdel. Norweigan Kjartan Sekkingstad and Filipino Marites Flor still remain captive.